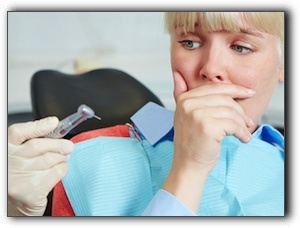 If you are dreading some upcoming dental treatment, you may want to consider oral conscious sedation. First off, oral conscious sedation or sleep dentistry is perfectly safe. At Salt Lake Dental Care – Clint Blackwood DDS, we have been providing sedation dentistry since 2005. We offer different levels of sedation and a choice of medication including oral analgesics, Laughing Gas, and IV sedation. When choosing a type of sedation, it is helpful to consider the type of anxiety (fear of immobility, fear of loss of control, fear of pain, etc), the specific procedure(s) you will undergo, the length of time required to complete the treatment, past experiences during treatment, and any complicating health problems. Call 801-938-8855 to schedule a consultation with Dr. Clint Blackwood to discuss your options. Perhaps you have a dentist-wary child who needs treatment. For simple dental procedures, topical anesthetics are applied to the gums and other tissues reducing sensation. If your child requires more sedation, Laughing Gas and general anesthesia are both safe options. Perhaps Mommy is the one who is anxious about her child undergoing dental work. Sorry – we can’t sedate you while your child is being treated – but you can take comfort in the fact that we take excellent care of our youngest patients. We make sure they are comfortable, relaxed, and understand exactly what is going to happen. Our team of child-friendly dental professionals have been putting children at ease since 2005. Regular dental check-ups are important for your child’s lifelong oral health, so it is important that your child has a positive experience during dental visits. If possible, don’t let your child know that you have dental anxiety. If he/she already knows, explain why your fears are unreasonable and why you are having treatment regardless of your anxiety. Show them how brave Mommy is because she wants healthy teeth. Salt Lake Dental Care – Clint Blackwood DDS offers full-service dental care including sedation dentistry, teeth whitening, and wisdom teeth removal. Thanks for visiting our blog. Check back for more helpful dental specifics from Salt Lake Dental Care – Clint Blackwood DDS in Murray.